A boozed-fuelled, knife-wielding man who threatened a police officer during a confrontation in a Derbyshire street has narrowly been spared from going to prison. John Rhodes, 32, of Evershill Close, Morton, was involved in a fracas with police on Derby Road, at Wingerworth, after officers had been called to a disturbance, according to a Chesterfield magistrates’ court hearing. Prosecuting solicitor Becky Allsop told the hearing on February 6: “The police were called by the ambulance service on the afternoon of September 5 after there had been concerns about Mr Rhodes who was in drink and lying in the road and the he sat in a vehicle. 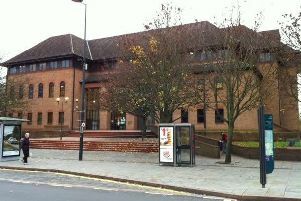 Police were called due to concerns for the safety of the defendant, according to Mrs Allsop, and they were warned that Rhodes had a knife. Mrs Allsop said Rhodes told one officer, a Pc Hague, to stay away or he would stab him. She added: “The officers stated that they were 12 or 15ft away from Mr Rhodes and it looked like he had a silver knife in his right hand. “He was waving the knife around at the officers and after reasoning with him he dropped the knife and sat down on a stone wall. Rhodes pleaded guilty to possessing a knife in a public place after the incident on September 5. The court heard that Rhodes committed the offence just six days after he had been given a community order for an assault and failing to stop after a road traffic accident. Defence solicitor Euan Edwards said police had been alerted because Rhodes had originally been lying in the road. Mr Edwards added that his offending had coincided with a relationship breakdown and with the deterioration of his mental health. Rhodes had also lost his driving licence and his job following his driving offence and he started drinking heavily and using other substances, according to Mr Edwards. But Mr Edwards explained Rhodes has since been doing well with the probation service and he is working to address his alcohol issues. Magistrates sentenced Rhodes to 16 weeks of custody suspended for 12 months with a Rehabilitation Activity Requirement and 150 hours of unpaid work. Rhodes must also pay a £115 victim surcharge and £85 costs.